I leave the lane and walk along a footpath beside a farm, greeted by the barking of dogs. The thistledown days of autumn are nearly over. I enter a spinney of trees where tangled willows block the path, before finally crossing a stream and emerging onto the open hillside of Stapeley Common. An old pilgrims’ route crosses the hill, the trackway carved between the gorse bushes. I follow the track, enjoying views opening out across the Welsh borders. Eventually I reach my destination. There, in the shadow of Corndon Hill, are the 15 standing stones of Mitchell’s Fold. 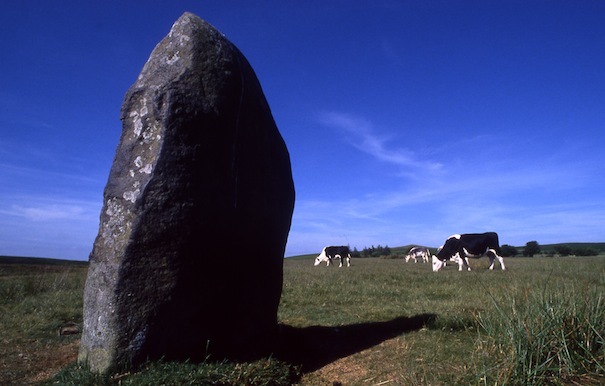 Mitchell’s Fold is the best example of a stone circle we have in Shropshire. It’s been dated to the Bronze Age and the biggest stone stands around 6 foot tall. It’s a wonderfully peaceful place; the sheep-grazed turf emanates a gentle energy. Is this energy I feel the reason our ancestors chose to form a stone circle here? Or is the energy a result of thousands of years of people heading to the monument; pilgrims’ footprints somehow energising the ground within the circle? Whilst the circle’s exact purpose is unclear, some believe the stones are aligned to solar or lunar cycles. They’d certainly have been used as part of ritual celebrations. Long before Christianity arrived, people celebrated the festival of winter solstice or Yule, and as our ancestors would have had a much closer connection with the landscape, the shortest day of the year would have been a cause for celebration as it meant light would soon return to the world. Today, winter solstice has been lost in the modern celebration of Christmas, though many keep old ways alive with Yule logs and festive greenery. Deep within the human psyche is a desire to connect to a source of energy at special times of year. That could be by spending time with loved ones at Christmas or going to church… or it could be by trying to find sacred places in the countryside where a ‘universal energy’ in the earth feels strongest. It could be anywhere that creates a sense of wellbeing, a place that energises us. Stone circles and other ancient sites have been plotted on maps and linked with so-called ley lines. It’s not just ancient monuments in the countryside that are considered sacred: trees are also a great source of inspiration and energy for many people. Druids believed oak trees are the most sacred of all, and around winter solstice, they’d cut a bow of mistletoe from an oak as part of fertility rituals. There is a superb oak tree near Cressage, known locally as the Watch Oak; a sentry standing guard next to a quiet lane. It’s been pollarded in the past to prolong its life, and its girth of over nine metres marks it at around 900 years old. The concept of hugging trees to soak up their energy has been much maligned, but research carried out in Finland suggests the practise could actually improve our general health. When a hawthorn and an ash tree grow next to a freshwater spring, it is considered to be a very special place, and we have such a place at Severn Valley Country Park called Ethelfleda’s Well. It’s a tranquil spot on a crisp winter’s day, with the sound of the clean cold water trickling from deep within the earth. Tied to the branches of the trees are coloured ribbons – people carry out tree dressing and make a wish at this special place. To get back to my car after visiting Mitchell’s Fold, I walk back over Bromlow Callow. This is a small hill with a summit crowned in larch trees. I stand at the top, gazing between the trees at the wonderful views. I look down and, next to the path, I spot a Coke can that’s been dug into the ground. Sticking out of the can are some cut flowers and two pink plastic butterflies. Someone has loved and lost. They have marked their sacred place in the landscape. This winter solstice, where is yours? Mitchell’s Fold is a scheduled ancient monument – this gives it protection and stops it being damaged. Unfortunately our ancient trees are not afforded the same level of protection. The Ancient Tree Hunt aims to map our veteran trees so that they can be looked after. If you’ve spotted a large tree, take the time to log onto ancient-tree-hunt.org.uk. Over 10,000 trees, including the Watch Oak near Cressage, have been logged on this webpage.